When you’ve been coding for six straight weeks for SixPrizes 6.0 and have lost your mind. Well then. (Alrighty then? Alrighty then!) It’s been a minute, 6P. Nice to make your acquaintance. My name is Adam and I created this website some eight-odd years ago while I was a senior in college. I am no longer a senior in college and now trail closely the three-decade mark on this planet. Where has the time gone?? As some of you may have noticed — or others, more likely, not noticed at all — I’ve been out of the spotlight since ~2013. I was heavily involved as the face of the site and producing content early on, but at a certain point I felt wholly unqualified to share opinions (I haven’t played actively since 2011!) and wanted to push our writers as the representatives of SixPrizes. They were the ones shipping product. Their work you flocked to read. (Right?) 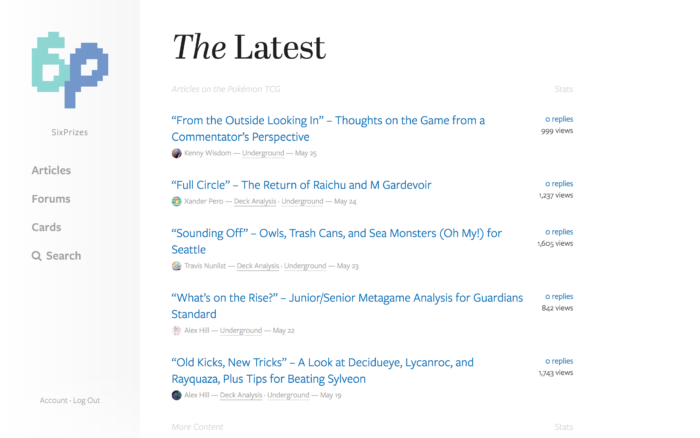 I did not want to flood the front page with the what I thought were inane site updates from myself. But maybe that was a mistake. Maybe you guys wanted to hear from me even if I had nothing to contribute regarding the Pokémon TCG itself. The truth of the matter is that writers come and go — look back through the archives and notice how few writers remain from not-long-ago 2015 — and so the faces of 6P have been fleeting. That’s a problem. I still feel totally out of touch with the community (did Virbank implode yet? is Chris Fulop still reigning National Champion?) and have little desire to become involved again. I dread coming to the realization I’ve been living my life a Groundhog Day. Thankfully, Alex Hill and Christopher Schemanske agreed to step in and be the eyes, ears, and voices of 6P. They are doing a great job thus far keeping content flowing and have brought some neat ideas to the table. The marathon of 10 (yes — 10!) articles in a row in the days leading up the North American Internationals should be an event in itself. I still have to yell at Alex every once in a while when he forgets what an en dash is and explain didactically to both the importance of detail in all aspects of publication, but 6P is moving forward. Again! Truthfully, editing destroyed me. It’s incredibly difficult work to do well. I remember clearly one specific article I edited back in the fall that completely drained me. Sucked my will to live. It took about 18 grueling hours to complete. 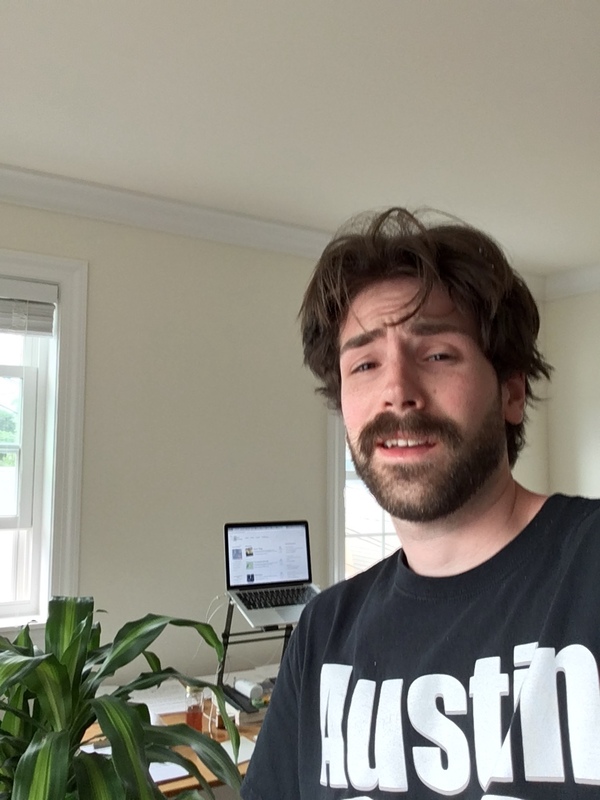 I wanted to do absolutely nothing for five days afterward besides check out of reality and watch drivel on Twitch nonstop like a mental patient. It was bad. I’m really proud of how we pushed the limit with the question “What can an article on the Pokémon TCG be?” but without the correct talent or direction it becomes nightmarish to live up to old standards. After two weeks of respite following the unburdening of April 1st, I decided to move forward with a redesign since the site had desperately needed one for many months and I didn’t foresee the task being soon undertaken with the proper fervor and alacrity by anyone besides myself. From 2015 up until recently, I had been taking on freelance web development work between days of editing and prioritized those freelance projects over anything SixPrizes related, hence the stagnation. Prior to then, I had been doing SixPrizes exclusively and so my available energies were more often channeled into redesigns. Design work is challenging and intensive for me. It teeters on the edge of being “too difficult” and “within capability.” I basically had to hole up and keep my phone off all day and go at this 100% to get it done. In the past, I don’t recall spending much more than two weeks on a design while also editing articles, scheduling content, answering emails, etc. This one took me six weeks straight — every day, all day as much as I could handle before my brain turned to goo. This design was created with the (at the time) super popular Atahualpa theme which fell the way of, well, Atahualpa himself after new, better themes were released by the coming horde WordPress developers seeking fortune in the years following. It was an attractive option in 2009 though because it was flexible (up to four columns!) and easy for newbies like myself to customize. 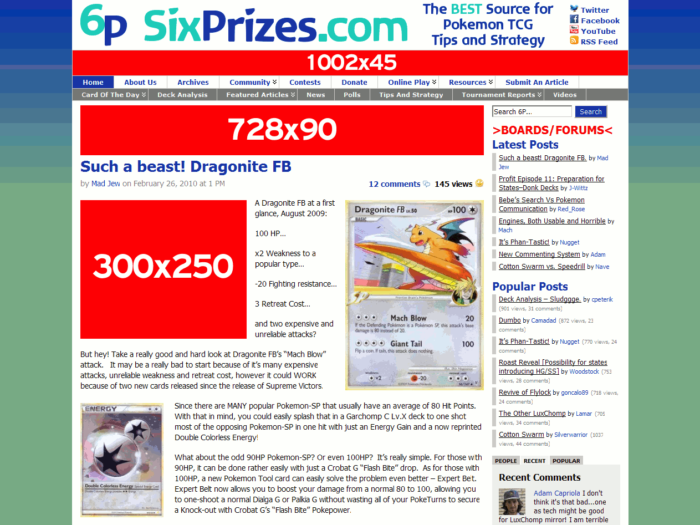 The screenshot above was taken to showcase ad placement areas (highlighted in red) for potential advertisers; I have only one other low-res image which shows an earlier variation of the home page. I very actively tinkered with elements of the design during its existence. It was all new and fun to me. The snapshots from this era are pretty dead on Archive.org because I deleted Atahualpa and its corresponding theme files from our server without backing them up (I wasn’t thinking!) but you can still click around and look at the mangled layout. The text at least is all still there. One novel artifact from 6P OG: Anyone remember the “Street Team”?? I’ll be honest: I forget the time spent assembling this design. I had no idea what I was doing. The theme used here was the free Prototype child theme, hacked together with the skill of a budding 12-year-old programmer, and I believe the objective was to tie in community interaction as much as possible. 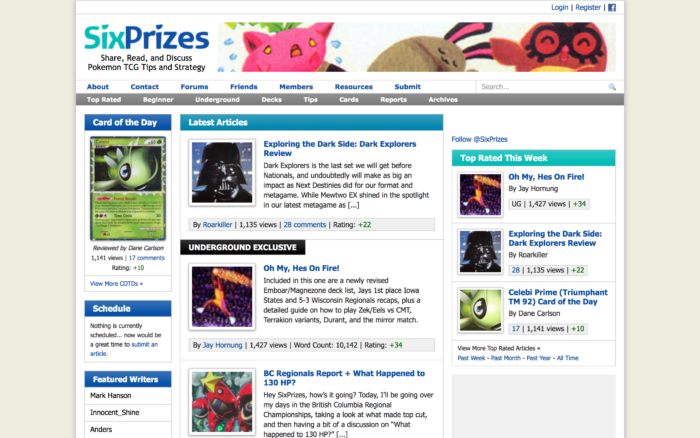 On that front, there was much success — SixPrizes peaked in popularity (as defined by page views) during this time. In the end, “Card of the Day” became more like “Card of the Week” and reader submissions dwindled, leaving the left column above desolate and wanting to be reimagined. I also grew loathsome of the advertisements and resolved to remove them, which would permit unprecedented freedoms in the following design. 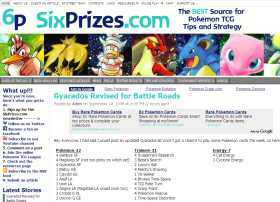 SixPrizes 2.0 launched January 2011 and it is still fairly intact if you would like to view it on Archive.org. I blush at this sight design. Knees become jello. I think, “Damn, that looks good.” Why did we ever change?! Many page elements are clear though as titles grew in length and description over time, whitespace pervaded and clarity diminished. This design also did not translate well to mobile and the individual articles had poor typography. I strain to read them now, at least. I made an announcement about this design (because I was proud of it!) on October 31, 2012 and it can be viewed in its entirety on Archive.org. 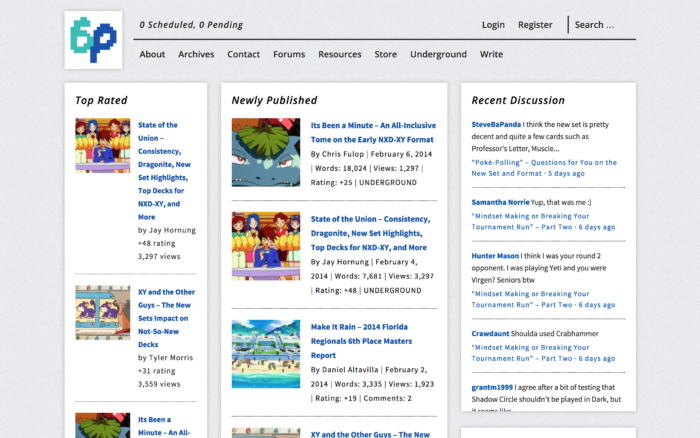 Version 3.0 and every following design have been custom-coded Genesis Framework child themes. I find Genesis has the available hooks and filters to do pretty much anything I want. It seldom seems to impede me; let’s put it that way. 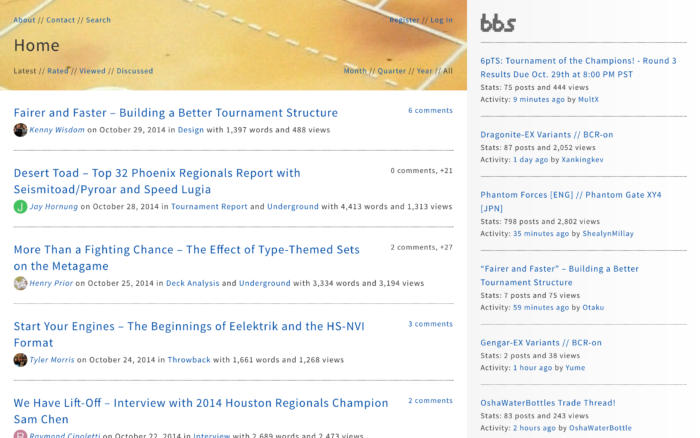 The impetuses for this somewhat radical shift from 3.0 were 1) thumbnail selection driving me crazy and 2) a desire to promote the new forum software (labeled here “bbs”). 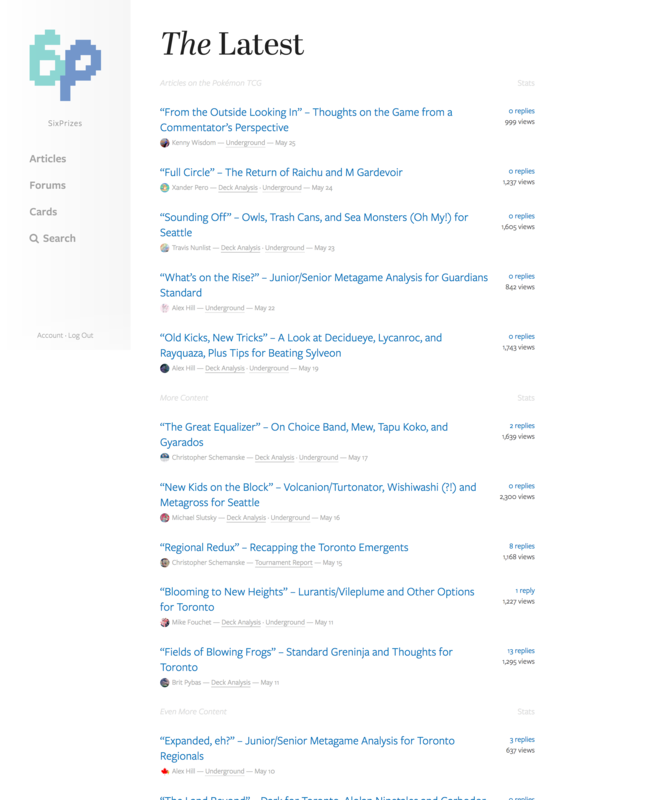 The thumbnails are the square images associated with each article on the archive displays for 2.0 and 3.0. I would spend sometimes hours trying to find the perfect thumbnail — they are important! — and I strongly wished to cut back on the time it took to edit a piece. This design eliminated thumbnails and the cognitive load that was eating at me. On the right side is the latest forum activity. My hope was that showcasing community discussions would help build the community and make the home page seem lively — worth visiting once a day or more for updates. The online forum, however, remains in freefall. I made no announcements about this design, but you can view it on Archive.org. Again, I made no announcement of this design. It is based off of a front-end developer’s website I happened upon and thought looked good so I replicated aspects of it. Again, no thumbnails (well, sort of; they’re small and circular) but I ended up selecting thumbnails anyway all this time in the backend because those same images get purposed for social media link previews, and to not select an image would leave the featured social media image up to chance. What can I say — I dislike coin flips as much as the next Pokémon player! Editing got taken to a much higher level with this design. While the archive displays are somewhat boring, detail was funneled into the individual articles themselves. The typography for 5.0 is vastly better than that of any previous iteration (differing body and headline fonts the first time!) and many other actions were taken to improve readability. Version 5.0 can also be viewed on Archive.org. 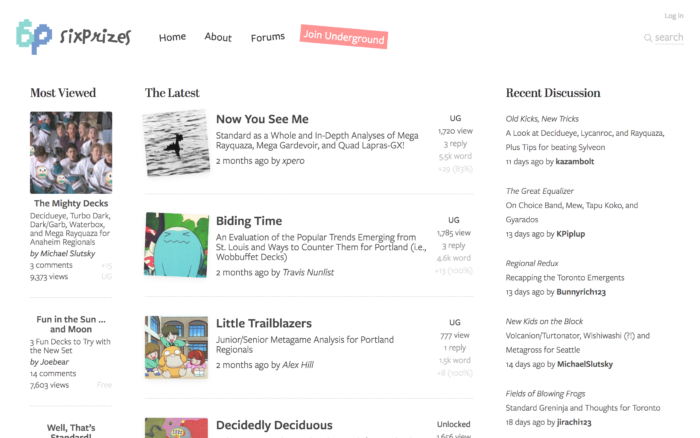 The goal with this most recent redesign has been to make 6P fun again. 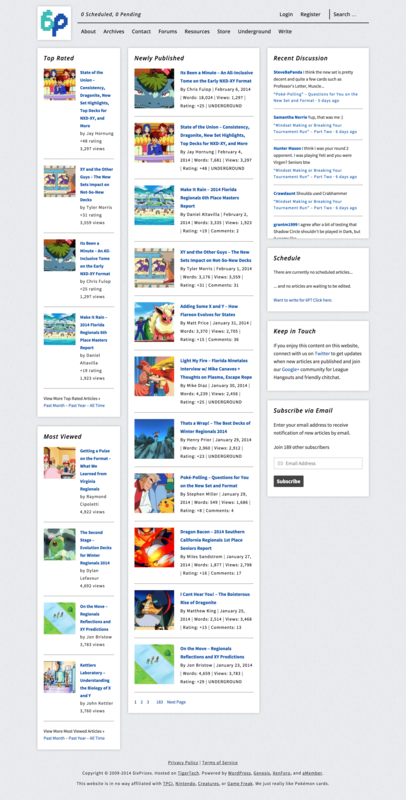 Some elements are crooked, the link colors within articles are loud, the titles are emphatic, thumbnails return. Mobile friendliness was a prominent consideration in my mind when putting this all together. I only just upgraded my dump phone (flip phone) to an iPhone last April. I hardly use it for anything besides taking pictures and begrudgingly responding to text messages. However, I am told many people browse websites with their phones and it’s important to be mindful of those individuals. So there. I care about you! There is a lot going on in 6.0, so play around with it and report back with what you think. Ideally the design will evolve over time with feedback and remain in constant development. On a final note, everyone: please do not take the game in the seriousness imposed. I realize Pokémon now is being swept up by “esports” phenomenon/circus/charade, and attitudes and consciousnesses will shift as the lights grow brighter and purses larger. That’s fine. Times change; money moves. I hate that word. Despise it. All it means is that you are really good at doing what other people want you to do. Your livelihood hangs upon the perceptions of others. Professionals are sterile. Professionals are castrated. Professionals have lost their minds. Strive to be extraordinary. Strive to be authentic. Strive to be excellent. Create art and inspire others. Xander’s Seattle Recap, Methods and Madness for Beating Garbodor, and a Patient Waterbox.